Ultimately, the measure would be intended to allow Parliament to pass legislation to delay Article 50 and put off Brexit, something that May is reportedly quietly considering as an option but has continued to publicly oppose. This comes after MPs earlier this month passed two amendments that limited May's ability to run out the clock to force MPs to vote for her deal by threatening a 'no deal' scenario as the only alternative. 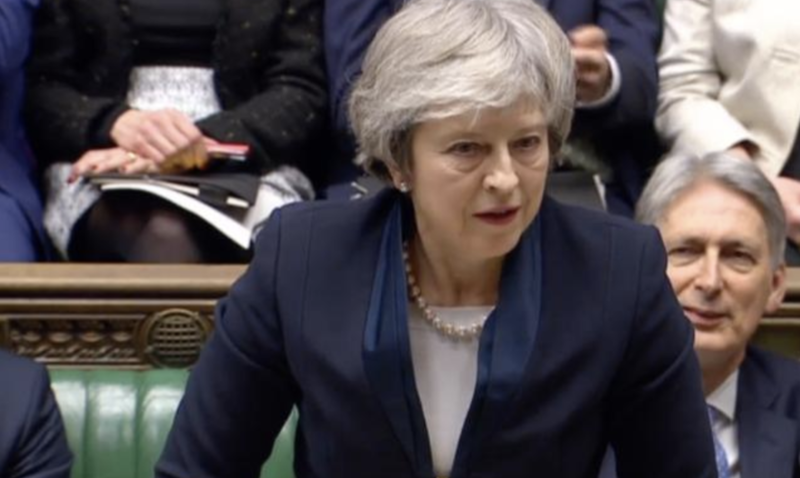 If the new amendment, which the group plans to table on Monday, the same day when May is expected to present her "Plan B", which is expected to be put to a vote the following week. 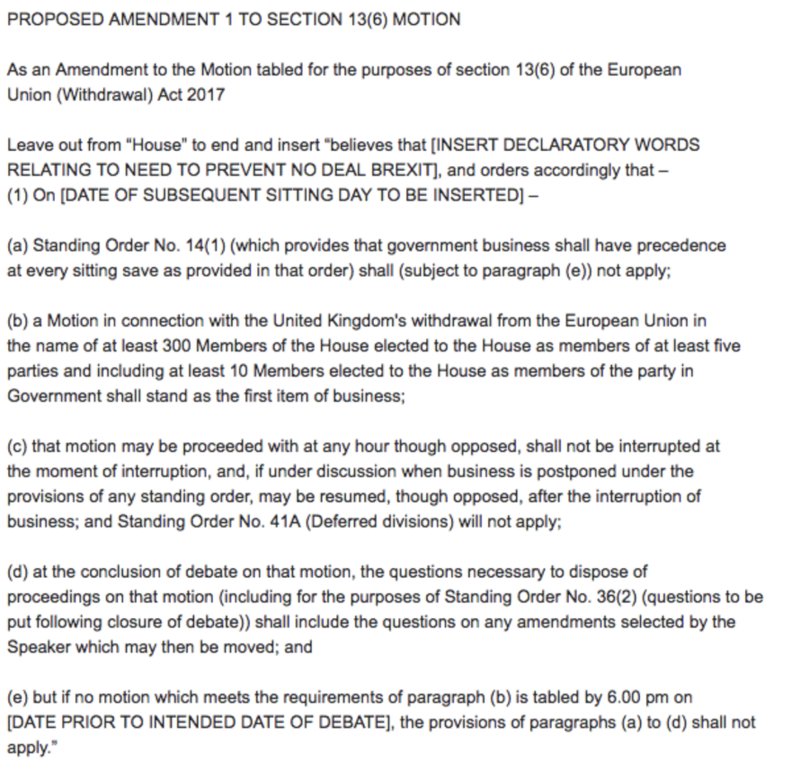 If the motion is brought for a vote, it would mark the fifth high stakes vote in the House of Commons this month (the two prior amendments, the deal vote, the no confidence vote and now this). Rebels are now coalescing around a new amendment which would overturn centuries of constitutional rules that give government business precedence in the Commons. If the amendment succeeds, it would allow a motion put forward by a minority of 300 MPs across five parties – including 10 MPs from the governing party – to stand as the first order of business. This would let a cross-party coalition of backbench MPs to grab power from the government and allow bills to be brought up and considered by the House. Legislation could then be tabled by backbenchers to block a no-deal Brexit – something for which there is likely to be a Commons majority. ...and a draft of the amendment. The plan, which MPs are calling European Withdrawal 3.0, backbenchers would be able to compel the government to request that Article 50 be delayed. A critical part of the bill - dubbed European Withdrawal 3.0 - would postpone the UK's departure from the European Union on March 29 if parliament fails to agree on a way forward by then. That is the day on which Article 50 - the timetable for the UK's withdrawal - expires. Any extension would have to be agreed by the other 27 members of the EU. But it's still unclear whether this plan has a strong chance of passing, given that no clear consensus alternative to May's plan has emerged. One MP who opposed the plan told CNN that he believes seizing power from the government would be an affront to the British people, who voted for Brexit. The notion that the amendment would allow a minority of 300 MPs to control what business is brought in front of the House of Commons is also controversial as it cuts against the constitutional principal mandating that only a government with a majority be able to control business. "I cannot think of any precedent for Parliament giving itself control over the government. It is genuinely historic. We used to take power from kings and peers and now we are arguably taking it away from the British people, and we are doing it in an arbitrary way because we do not like what they have said." However, one MP who apparently supports the effort said the notion that it would be somehow undemocratic isn't accurate, because any final decision would still require the support of a majority MPs. Regardless of what happens, while US markets are closed on Monday for the Martin Luther King Jr. Day holiday, it's looking like it will be another extremely eventful day in the UK.